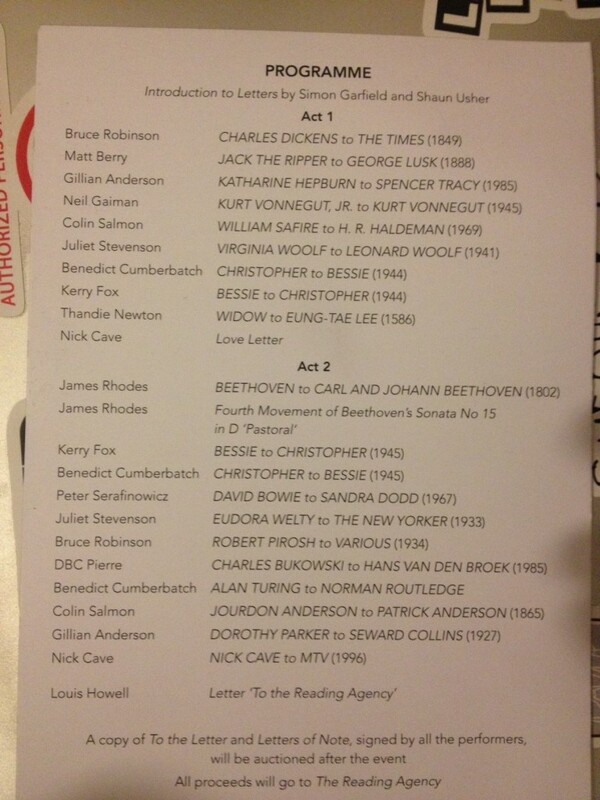 Letters Live, ein Live Event basierend auf dem Buch Letters of Note von Shaun Usher, fand am Dienstag 10/12/2013 in London statt. Das Buch sammelt und ordnet faszinierende Briefe, Telegramme, Postkarten, Faxe und ähnliches. Bei dem Event, bei welchem einige dieser Briefe vorgetragen wurden, waren Gillian Anderson, Matt Berry, Benedict Cumberbatch, Nick Cave, Kerry Fox, Neil Gaiman, Thandie Newton,Colin Salmon, DBC Pierre, James Rhodes, Bruce Robinson, Peter Serafinowicz und Juliet Stevenson zu sehen und zu hören. 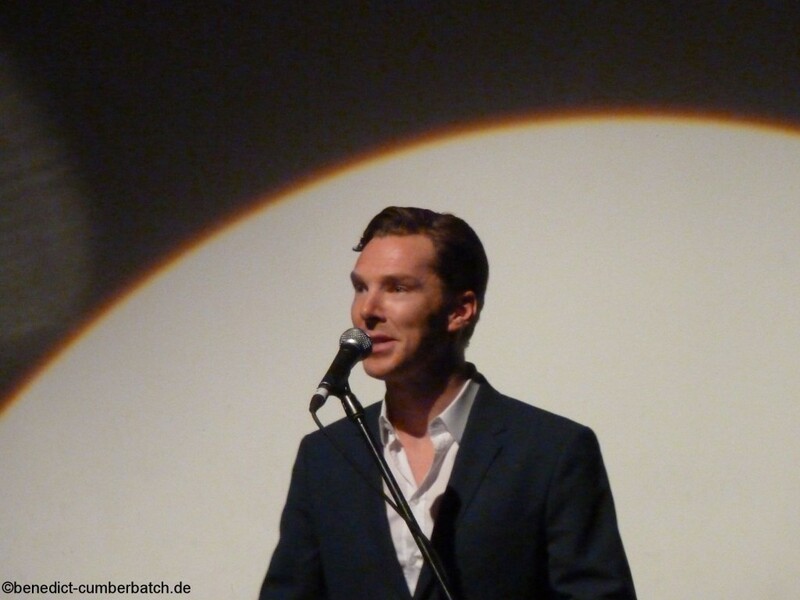 Benedict liest 2 Liebesbriefe von Chris Barker an Bessie (Elizabeth) Moore. Der erste Brief ist aus dem Jahr 1944, während der Zweite aus dem Jahr 1945 stammt. Yesterday I got your letter card dated the 3rd of April. There was one from deb and another one from Mum, and, of course, I had to read these first. And I could read yours only once, and then had to put it in my pocket, while my poor old head tried to cope with its content as far as I could remember. You have come at me with such terrific rush of warmth, and I am so very much in need of you. Well, I washed and made my bed (it was six o’clock before I received your letter) and fidgeted around. Then I thought, ‘I must read it again before I go to sleep’, so I pushed off to the latrine (where the humblest may be sure of privacy) and read your words again. The comic expression ‘It shakes me’ is true in a serious sense about this deeply thrilling state of well being that you have caused or created. After I had re-read your letter, out came the chessman, and we played one game (which I won) before adjourning to the canteen to gather round wireless for the news (a rite in these surroundings). Then we were collared for Bridge which we played till ten o’clock. All the time, the only thing I wanted to do was read your words, this tiny part of you, again and again. Back in the tent, and to bed. How impossible to sleep with thought and wonder of you hot within me. As I toss and turn and wriggle and writhe I think of you, probably doing the same. Isn’t it blooming awful? I know that if I think of you, I will not sleep, yet I keep on thinking of you, and get hotter and hotter. Phew! I could do with a couple of ice-blocks around me. Finally to sleep. Up in the morning, my first thoughts, of your nearness and your distance from me, and the hope that I can race off this first six pages, to post this afternoon. Unfortunately there is no likelihood of my early return. I must be another year, I may be another three or four. Relax, my girl, or you’ll be a physical wreck in no time. Regard me as what you will, but don’t altogether forget circumstance, distance, environment. I do so joyfully, happily, eagerly, but you must have more sense. In the film tonight there was a joke that the state of being in love was the happiest way of being miserable. So be miserable happily, don’t look over your shoulder too much, enjoy what is, so far as you can, and remember the old, wise tag ‘Today is the tomorrow we worried about yesterday’. I am a born worrier myself, but feel I could be all that you wanted me to be. Probably more important, I know that you are what I want, not in any limited sense, but in all. I want to confide in you. I want to creep into you. I want to protect you. That I am not capable is unimportant, what is significant is that you should think I am. My hands cannot caress you, my words strive hard to tell you all the things I dare. You spoke of yourself being ‘guilty of slobbering’ – it’s no crime. I am proud of it. If your incoherent babblings mean what mine do, it’s jolly good. Don’t worry about being bounced out of favour, and try to grow out of this engulfed – nothing belongs to oneself’ feeling. Regard me as a promise rather than a threat, and pick holes in me where you can – so that I seem less regal. Remember we are both in this together, and that it has somehow occurred undesignedly, unrehearsed, because we had it in us. Yes, I wish that I was with you. But life is hard – wishing won’t make it easy. My thoughts are with you far too often for my physical serenity and my mental equilibrium. During the day I simply lap you up and cause trouble at night. Engulfed describes my state, too, a rather floundering, uncertain one. I wonder what you look like. Don’t have a special photograph taken. I know you haven’t a bus-back face but I have never looked at you as now I would. I wonder how many times I have seen you, and how many we have been alone. Now my foolish pulse races at the thought that you even have a figure. I want, very much, to touch you, to feel you, to see you as you naturally are, to hear you. I want to sleep and awaken with you. I want to live with you. I want to be strong and I want to be weak with you. I want you. I want my letters to be of interest, so please let me know how and what you want me to write. On occasions, you’ll understand, I may not be in a position to write. Let me know if you think I am mad. When my signature dries I am going to kiss it. If you do the same, that will be a complete (unhygienic) circuit. I have just heard the news that all the Army men captured by ELAS are to return to their homes. Because of the shipping situation we may not commence to go before the end of February, but can probably count on being in England sometime in March. It may be sooner. I have only just left our Major giving the signal as received from Alexander. It has made me very warm inside. It is terrific, wonderful, shattering. I don’t know what to say, and I cannot think. The delay is nothing, the decision is everything. Now I am confirming in my head the little decisions I have made when contemplating just the possibility. I must spend the first days at home, I must see Deb and her mother. I must consider giving party somewhere. Above all, I must be with you. I must warm you, surround you, love you and be kind to you. Tell me anything that is in your mind, write tons and tons and tons, and plan our time. I would prefer not to get married, but want you to agree on the point. In the battle, I was afraid. For you. For my mother. For myself. Wait we must, my love and my darling. Let us meet, let us be, let us know, but do not let us, now, make any mistakes. I am anxious, very anxious, that you should not misunderstand what I have said. Say what you think – but – please agree, and remember I was afraid, and I am still afraid. How good for us to see each other before I am completely bald! I have some fine little wisps of hair on the top of my head. It is not much good me trying to write about recent experiences now that I know that I shall be able to tell you everything myself within such short time. What I have my eye on now is the first letter from you saying that you know I am alright, and the next, saying you know I am coming to you. I must try to keep out of hospital with some of these post P.O.W. complaints. Plan a week somewhere (not Boscombe or Bournemouth) and think of being together. The glory of you. When I was captive I used to try and contact you and think hard ‘Bessie, my dearest, I am alright. Do not worry.’ I never felt that I got through, somehow. But now it is over, and you know that I am alright and going to be with you soon, to join and enjoy. Do not get very excited outwardly. I am conscious of the inner tumult, the clamour, but I am not too much outwardly joyful. Moderation is my advice. Watch the buses as you cross the street. We are free of duties and yesterday I went to our friends in Athens, taking some of your coffee and cocoa, which they were very pleased to have. Thank you for sending it. We were embraced very kindly, kissing and so on, continental fashion. I hope that you will not start buying any clothes (if you have the coupons left), because you think you must look nice for me. I shall be sorry if you do. Just carry on as near as possible to normal. My return at the present time allows us to make public our mutual attachment. I shall tell my family I hope to spend a week away with you somewhere during my leave. My counsel to you is to tell as few people as possible. To someone like Miss Ferguson you can politely reply to her observations that you thought it was your business, rather than hers. Try to avoid preening yourself and saying much. This is my advice, not anything but that. I hope you understand. I do not ever want it to be anything but our affair. Do not permit any intrusion. I do not know how long leave I shall get. I could get as little as fourteen days, and I may get as much as a month. I am wondering how I shall tell you I am in England. Probably it is still quicker to send a telegram than a letter, and I hope to send you one announcing that I am on the same island. I will send another when I am actually soon to get on the London bound train, and you can ring Lee Green 0509 when you think I have arrived there. You must bear in mind that I shall be with my brother until we get home. Also, that, having been away from home for so long, my parents will want to see a lot of me. I hope that everything will work itself out without any unhappiness to anyone. I shall be in great demand from two or three points and it will be difficult to manage without offence. It is a strange thing, but I cannot seem to get going and write very freely. All I am think about is I am going home. I am going to see her. It is a fact, a real thing, an impending event, like Shrove Tuesday, Xmas Day, or the Lord Major’s Banquet. You have to be abroad, you have to be hermetically sealed off from your intimates, from your home, to realise what a gift this going-home is. The few letters of yours that I had on me, I burnt the day previous to our surrender, so no one but myself has read your words. In the first ten days of our captivity I did not think any soft thoughts about you, all I did was concentrate on trying to tell you I was alright. But when we had a few supplies dropped by aircraft (at great risk to themselves in the misty snowbound greek mountain villages) and we started hoping we might get sent home upon our release, I was always wondering about you, about us. It is a pity that the winter weather will not be kind to us out of doors. But it will be nice sitting next to you in the pictures, no matter what may be on the screen. It will be grand to know that we have each other’s support and sympathy. Won’t it be wonderful to be together, really together, in the flesh, not just to know that a letter is all we can send? 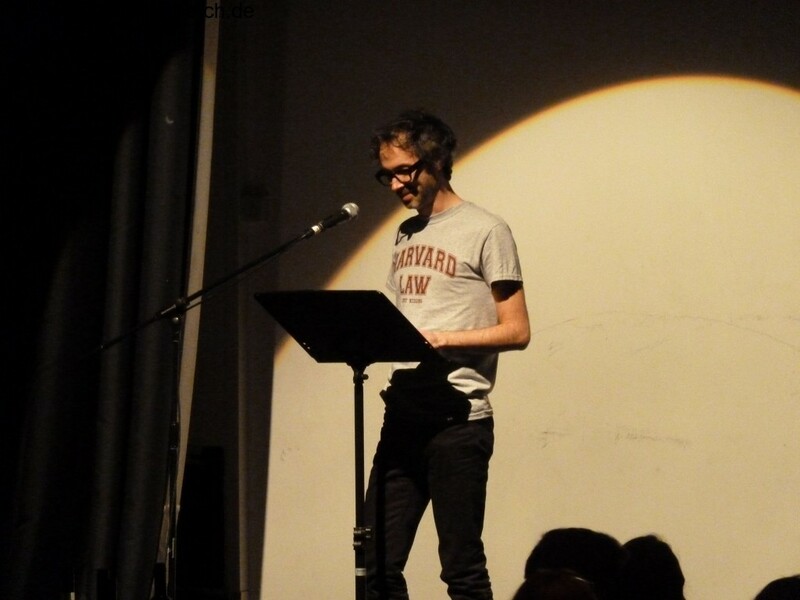 Nach dem Interval war es an James Rhodes, den zweiten Teil des Abends einzuleiten. Mit einem Brief von Beethoven an seine beiden Brüder und eines seiner Werke eröffnete er einen spannenden zweiten Abschnitt. I don’t think I really do know much about jobs, except the one I had during the war, and that certainly did not involve any travelling. I think they do take on conscripts. It certainly involved a good deal of hard thinking, but whether you’d be interested I don’t know. Philip Hall was in the same racket and on the whole, I should say, he didn’t care for it. However I am not at present in a state in which I am able to concentrate well, for reasons explained in the next paragraph. I’ve now got myself into the kind of trouble that I have always considered to be quite a possibility for me, though I have usually rated it at about 10:1 against. I shall shortly be pleading guilty to a charge of sexual offenses with a young man. The story of how it all came to be found out is a long and fascinating one, which I shall have to make into a short story one day, but haven’t the time to tell you now. No doubt I shall emerge from it all a different man, but quite who I’ve not found out. Glad you enjoyed broadcast. Jefferson certainly was rather disappointing though. I’m afraid that the following syllogism may be used by some in the future. I would like to start by thanking you all for the support you have given me over recent years and I am both grateful and flattered by the nominations that I have received for Best Male Artist. The air play given to both the Kylie Minogue and P. J. Harvey duets from my latest album Murder Ballads has not gone unnoticed and has been greatly appreciated. So again my sincere thanks. Having said that, I feel that it’s necessary for me to request that my nomination for best male artist be withdrawn and furthermore any awards or nominations for such awards that may arise in later years be presented to those who feel more comfortable with the competitive nature of these award ceremonies. I myself, do not. I have always been of the opinion that my music is unique and individual and exists beyond the realms inhabited by those who would reduce things to mere measuring. I am in competition with no-one. So once again, to the people at MTV, I appreciate the zeal and energy that was put behind my last record, I truly do and say thank you and again I say thank you but no…no thank you. Nach dem Event wurden noch 2 signierte Bücher unter den Zuschauern versteigert. Das erste Buch, Letters of Note, unterschrieben von allen Beteiligten des Abends, wurde von Benedict und Gillian Anderson präsentiert. Benedict machte dabei eine sehr gute Figur als Auktionär. Die Bücher gingen für £5000 bzw. £6000 unter anderen an Caitlin Moran, die sich an ihrem Tisch mit Guy Garvey und John Niven zusammengeschlossen hat, um das Buch zu ersteigern.